Offering land, businesses and property for sale from 27 countries in the region. Unique professional advice and guidance for the right lifestyle choice. Wouldn’t it be wonderful if summer vacations could last all year round? Imagine waking up and strolling out to sip a cold passion fruit juice on your rustic veranda, or coming home after a long day at work to relax beside blue waters in the shade of a palm tree? Well, while that dream is in the pipeline, how about using these Caribbean design ideas to get yourself ready, for when you are ready? One of the key features of a Caribbean style dwelling is a blurring of the whole concept of exterior versus interior. Partly-enclosed spaces like verandas, spacious porches and covered decks create a hazy merging of inside and outside, as do large doors opening onto a patio or ground-level pool. Covered exterior spaces also provide shady nooks to enjoy on hot days. For your Caribbean villa transformation, rustic natural materials are a must! Woods are generally gently weathered or painted in bright, breezy colors. Palm thatch awnings or umbrellas provide pools of shade as well as contributing to a tropical feel. Walls can be given a slight texture and finished in light, neutral shades. If you’re lucky enough to live in a region that doesn’t get much frost, decorative ceramic tiles can be the perfect Caribbean touch for your exterior brickwork, as well as on planters and around water features. For a Caribbean ambiance, you will want to avoid an overly rigid or regimented design. Think undulating, graceful lines, with curvilinear walls and paths. Palm trees and tropical plants will contribute to the atmosphere. If you have the space, a pool can be the perfect substitute for those ocean vistas you’re dreaming of. Another way to enjoy the soothing effect of rippling water is with ornamental ponds and fountains. 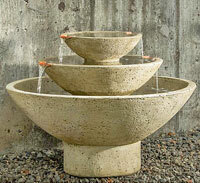 An outdoor water feature is practical as well as decorative – on hot days, flowing water cools the air around it to create a refreshing sensation. You can also add a tropical mood with carefully-chosen statues and ornaments – graceful mermaids, preening birds or frolicking dolphins will help create the atmosphere you want. Whether you’re planning a major revision of your property or just looking to enhance your existing design, a Caribbean theme is the perfect way to create a relaxing, inspiring environment. Even a few carefully chosen features can bring a tropical feel to your home. Let Outdoor Art PROS guide you on Caribbean design ideas to get yourself ready, for when you are ready! This entry was posted in Architecture & Design, Art, Culture & Education, Construction, Eco Construction and tagged Caribbean, construction, interior design, moving on June 28, 2017 by Sally Writes. Enter your email address to follow the Caribbean Land & Property Blog and get notifications of new posts by email. Broken my SIM, contacted Lebara twice this week, cannot get a response so that I can get a replacement SIM. Any advice? Dennis Bray on Moving to the Caribbean?